--Yesterday was the anniversary of the deadliest avalanche in US history. An avalanche came down on Stevens Pass and knocked two trains off their tracks. Ninety-six people died in the incident and it became known as the White Horror. To read about this historic avalanche, click here. --A hunter was attacked by a mountain lion near Mono Lake this week. The mountain lion was ultimately killed in the incident. To read more, click here. --In a piece of terrible news, it is looking more and more like 5000 houses will be built across the street from Red Rock Canyon in Las Vegas. To read an article about the next step that was recently taken toward this development, click here. --Red Rock Rendezvous is a world-class climbing event. There will be climbing instruction, competitions, slideshows, games and parties. This is one event that just gets better every year. AAI guides will be there to support the event and will be available for guided climbs or instructional programs both before and after the Red Rock Rendezvous. To learn more, click here. --Mountain Gear and Latino Outdoors, a national, non-profit organization committed to connecting Latinos to outdoor spaces, are hosting an Instagram contest to support increasing diversity in the outdoors and access to rock climbing. 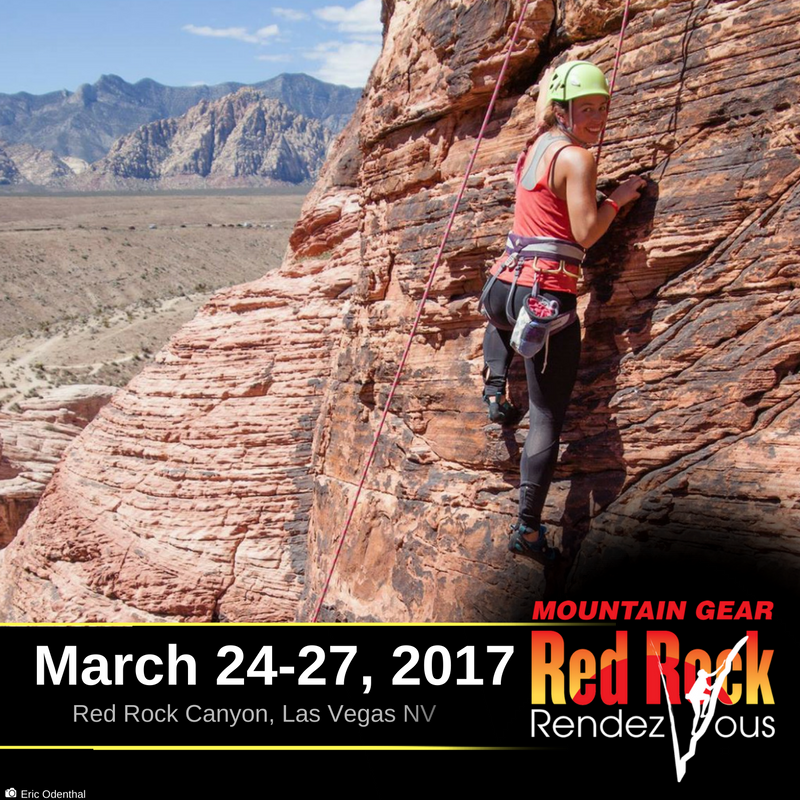 Red Rock Rendezvous sponsor, Mountain Gear, is generously donating five UClimb registrations to the festival, which will be held at Red Rock Canyon National Conservation Area just outside of Las Vegas, from March 24 to March 27, 2017. To read more, click here. --The Las Vegas Review Journal is reporting that, "Red Rock Canyon National Conservation Area officials say visitors can expect unusually long delays on the park’s 13-mile scenic drive as a construction project gets underway. Crews will begin pulverizing and repaving the loop in roughly one-mile increments Sunday evening after the gates close. The entire one-way road will be resurfaced over the course of the project, which expected to last into summer." To read more, click here. --The Durango Herald is reporting that, "a 34-year-old woman who struck a tree and died while skiing at Purgatory Resort on Saturday has been identified as Farmington resident Kressyda Ming, according to La Plata County coroner Jann Smith." To read more, click here. --The Denver Post is reporting that, "Vail police are again warning skiers and snowboarders of a growing trend of fraudulent lift ticket sales this season that has cost visitors thousands of dollars. So far this winter, there have been 39 such cases reported to police, an 875 percent increase over the 4 cases during the same period last year." To read more, click here. --The Aspen Times is reporting that, "a dog named Snoopy received 66 stitches during the course of a three-hour surgery Monday, but his injuries weren't because of a brawl with another canine, an attack by a wild animal or being struck by a vehicle. Instead the 50-pound cattle dog was, according to his owner, kicked by a skier in the Tiehack area of Buttermilk about one minute after Snoopy snapped loose from a leash. Three of Snoopy's ligaments were severed and the violent encounter left what owner Danny Brown called a "bloody mess" on the slopes of Tiehack." To read more, click here. --The Star Tribune is reporting that, "More than a dozen climbing routes on rocky cliffs in southern Utah's Zion National Park have been temporarily closed to help protect peregrine falcons." To read more, click here. --The Durango Herald is reporting that, "Hesperus Ski Area has been shut down since Tuesday after the Colorado Passenger Tramway Safety Board performed a routine inspection and found maintenance and operational issues that must be addressed." To read more, click here. --Denver 7 is reporting that, "a Colorado man who went missing while skiing in Japan earlier this week died in an avalanche, his wife confirmed through a GoFundMe page set up to pay for search and rescue efforts. 'After an exhaustive search, I am devastated to report that Mat will not be returning home at this time,” reads the message posted Saturday. “The search and rescue teams have determined that he perished in an avalanche, and due to the extreme conditions, we will be unable to recover him until Japan’s long winter season has passed.'" To read more, click here. --On Monday, Unofficial Networks was reporting that, "An avalanche hit the main employee parking lot at Snowbird around 5:25pm, burying 3 to 4 cars belonging to resort guests. The lot is called the Superior Lot and is just east of the Cliff Lodge. Fox New 13 is reporting at least 25 ski patrollers were on scene searching for victims but have not yet found anyone injured or buried by the slide." To read more, click here. --Apparently over 150 soldiers were killed during World War I in the high Alps. And now with glaciers receding due to anthropogenic climate change, the corpses -- perfectly preserved in the ice for nearly 100-years -- are revealing themselves. To read about it, click here.